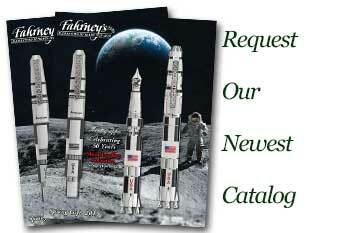 Order your William Henry RB8 Cabernet Osage Zinc-Infused Apple Coral Rollerball today from FahrneysPens.com. Fine Pens, Refills & Luxurious Gifts – great prices & fast shipping. 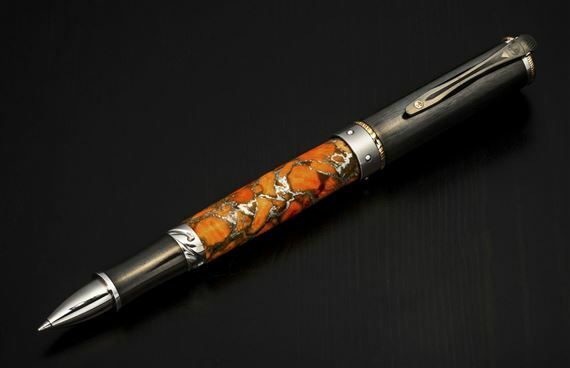 The William Henry Limited Edition Cabernet Osage is a mesmerizing rollerball pen featuring a barrel in 'Zinc Matrix' apple coral, and a light structure in aerospace grade titanium and aluminum. 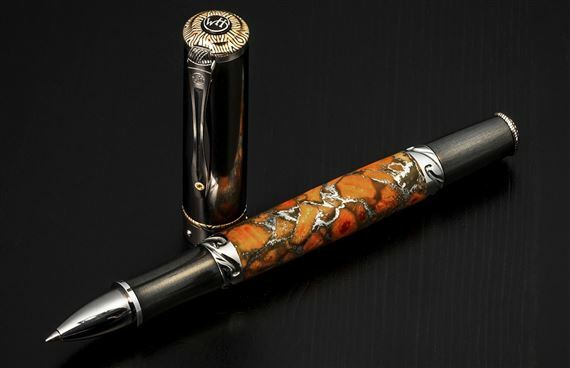 The accents on the carbon fiber cap are in Mokume Gane and sterling silver; the pocket clip is set with smoky quartz. This beautiful writing instrument also features William Henry's patent-pending Wavelock™ cap closure system – a ring of chromium steel balls embedded in a titanium ring which are captured in wave-shaped grooves in titanium collars for closed and post positions. Limited to 250 numbered pieces.